Though Digidesign are no more (having been swallowed up by Avid), the name is still synonymous with hard disk recording thanks to the industry-wide saturation of its flagship product Pro Tools. Yet Digidesign's beginnings were somewhat humbler, starting life as Digidrums in 1984. The brainchild of Peter Gotcher and Evan Brooks, the company's first products were custom sound chips for popular drum machines, followed up by Sound Designer, an early sample editor for Macintosh that could be used to finesse audio files for hardware samplers such as those from E-mu, Ensoniq and Sequential Circuits. Sound Designer was a success, and it established the first 'standard' file format for samples. Yet the Digies had something even more interesting up their sleeves: a fully modular sound design environment wherein various components could be mixed, matched and patched together by virtual cables. Dubbed Turbosynth, it also ran on the Mac, though it would subsequently be ported to Atari as well. Today's modular synthesist would have no trouble navigating the Turbosynth GUI, as it bears a striking resemblance to a modern modular system such as Reaktor, as well as certain graphics applications, with tools (modules) selected along the left and placed into the main workspace. There were 15 synthesis module types, including oscillator, sample, noise, waveshaper, filter, timestretching, delay, pitchshifter, diffuser, resonator, mixer, modulator, and multi-segment pitch, filter and amplitude envelope generators. Thanks to synths like Absynth and Alchemy, we take multi-segment envelope generators for granted today, but they were a radical departure from the usual ADSR jobs when Turbosynth hit the shelves. One trick was to string waveforms together into a sort of wavetable and then wrap a complex, rhythmic amplitude envelope around it for shifting, pulsating loops. While 15 synthesis modules may not seem like a lot, each one included its own unique collection of tools. The oscillator, for example, provided a number of preset waves to choose from, and the ability to roll your own. Due to the limited technology of its day, working in Turbosynth was a strictly offline affair, but the sound in progress could be auditioned via the Mac's built-in audio hardware. Once you'd cobbled together something you liked, it could be ported to a number of supported hardware samplers via an excruciatingly slow MIDI Sample Dump or, if you were lucky, SCSI. The latter was much faster, allowing the user to audition the sound on the connected sampler almost immediately. Later versions supported Digidesign's own SampleCell DSP hardware, as well as now-familiar formats such as AIFF. Turbosynth never got the notice it deserved, though it did pique the interest of industrial musicians, most famously Nine Inch Nails. Those who did have a play were rewarded with uniquely and unashamedly digital tones rich in a gritty character, courtesy of the now-primitive algorithms. It's surprisingly difficult to replicate its sound in the modern era - current software modulars simply sound too damned good! The reigning king of graphical software modular programming environments, Reaktor is a native program that allows prefab modules to be lashed together via virtual cables. Reaktor offers exponentially more modules and access to low-level operations that the devs at Digidesign could only dream about. There's not a lot Reaktor can't do. Craig Anderton once described Kyma as "Turbosynth falling into the hands of a race of super-intelligent alien beings", though the earliest version of Kyma actually predates Turbosynth. It bears a superficial resemblance, but with many times the tools. Kyma is probably the closest we can get to what Turbosynth would have become today. 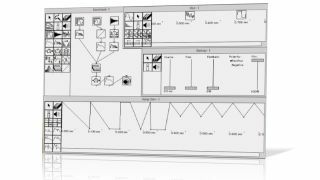 Cycling '74's now-classic software modular environment takes the idea to, well, the max, providing countless tools that can be mixed, matched, and patched into your own custom synths, audio effects, even graphics. Max provides hooks into external hardware like MIDI controllers, lighting, projectors, and VJ rigs too. Awesomely powerful.